Source water is untreated water from streams, lakes, rivers or underground aquifers that people use for potable water supply. Source Water Protection is an initiative to protect Ontario’s municipal drinking water from overuse and contamination and complements water treatment and monitoring by reducing risks to water supplies in the first place. Recognizing one of Justice Dennis O’Connor’s key recommendations from the Walkerton inquiry, the province has organized Source Water Protection on a watershed basis. The South Georgian Bay Lake Simcoe Source Protection Region, one of 19 regions in the Province, oversees Source Water Protection for the Black Severn, Lake Simcoe, Nottawasaga Valley, Severn Sound watersheds. Isn’t our drinking water already safe? Yes, your municipal drinking water is safe. Our region’s Source Protection Plan helps to ensure this. It’s just one of many barriers in place. 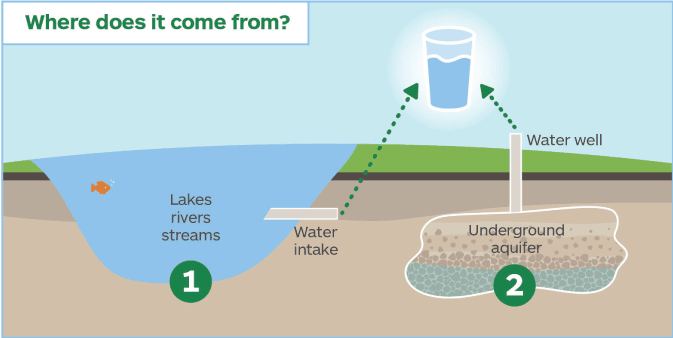 Whether your water comes from a lake, river or underground aquifer, our region’s Protection Plan provides a drinking water safety net from the source to your tap.